In the trade greenhouse benching is called staging. This video shows the options available for the greenhouse staging and shelving in a cultivar greenhouse. 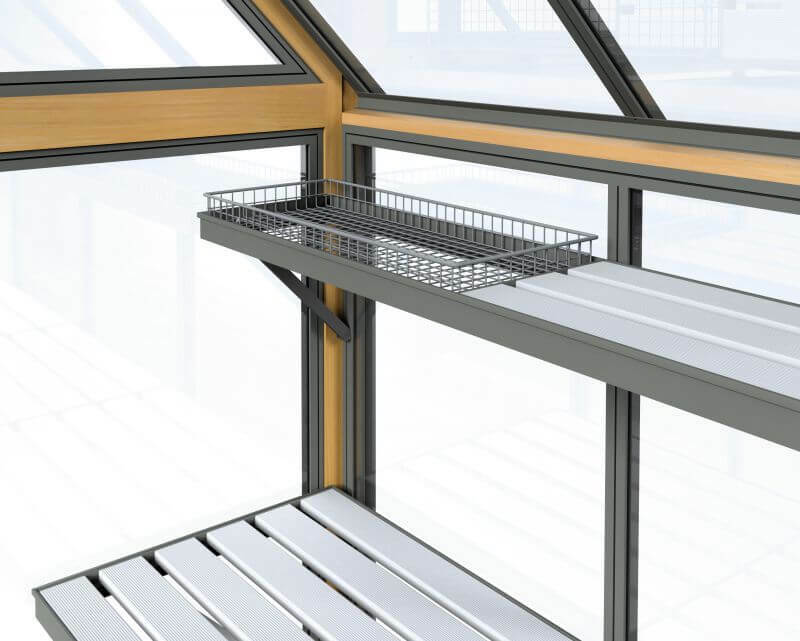 Essentially this is a surface based at a convenient height for working in the greenhouse. 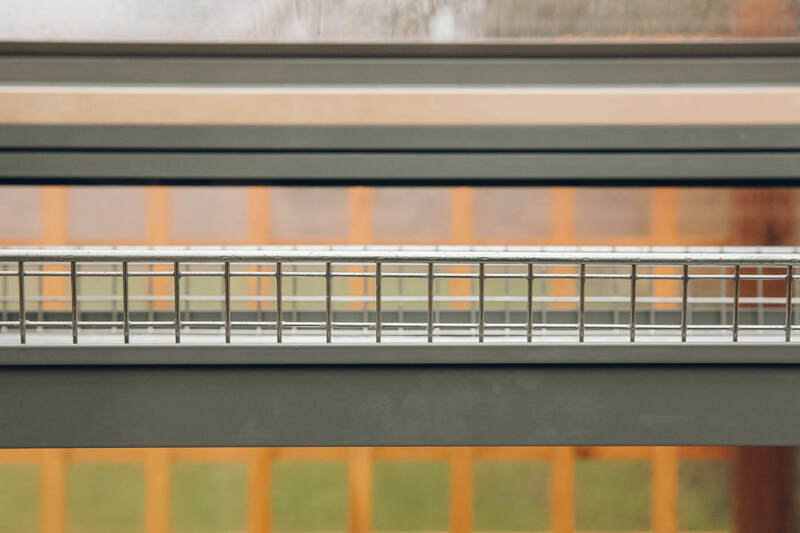 The height of this is usually set around 800mm from the base of the greenhouse which is a little below the level of a kitchen worktop for example. This being the case the top of your pots and seed trays will likely end up at worktop height which is convenient for watering and pricking out. 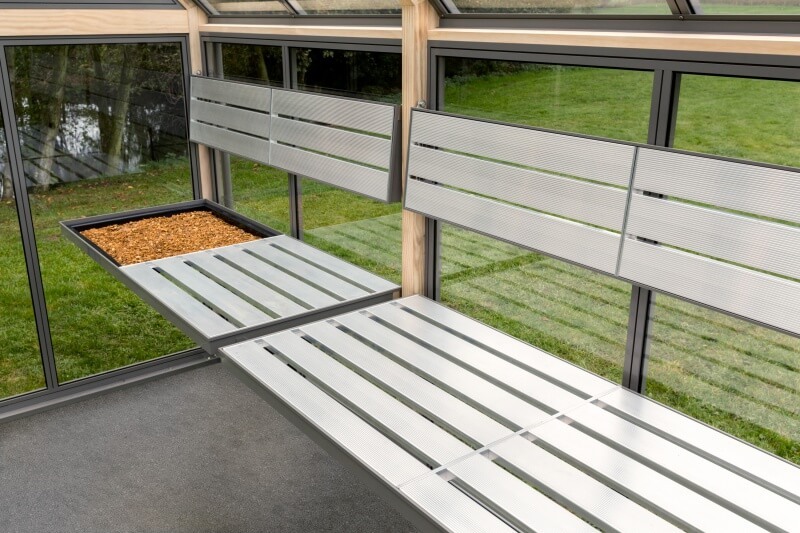 The sturdy framework on is made from powder coated aluminium to match the greenhouse and the aluminium slats are spaced to allow ventilation around the structure. Above the staging, closer to the eaves, a side of shelving provides additional storage. 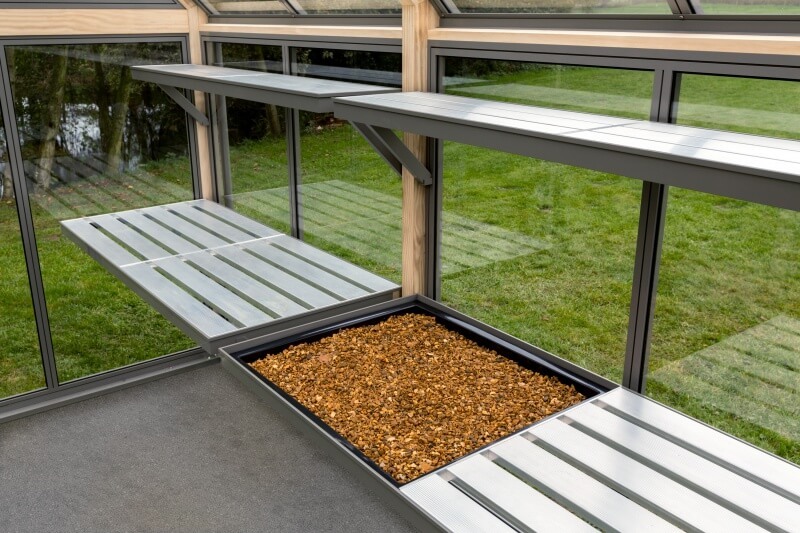 Shelving is commonly used for germinating seeds in trays, being slightly higher and closer to the roof glass it is warmer which often aids germination. Later in the year you might find it useful for it drying tubers or onions. The shelving comes with the option of a galvanized basket. Equipped with raised sides the basket is a handy addition which can be lifted in and out easily. This shows the tray at the end of the staging and you can see the shelving is folded down. The tray can be moved to a convenient position to suit your growing needs. 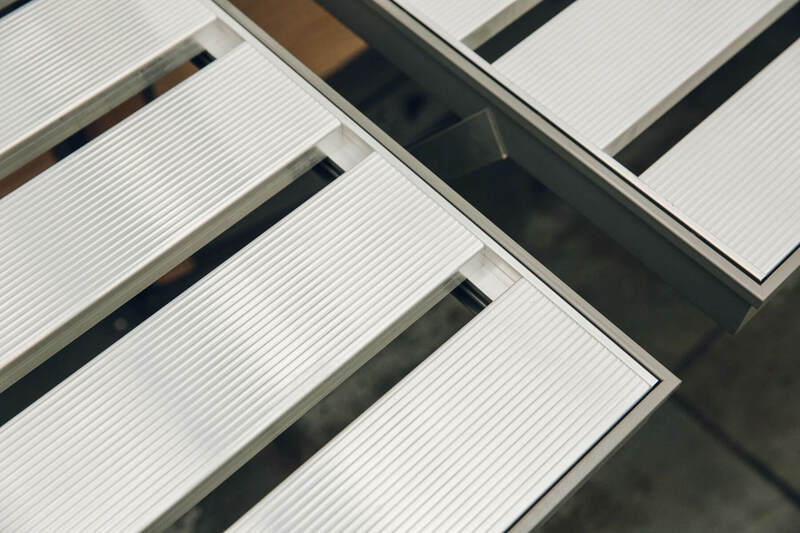 All the surfaces can be lifted out or secured in place and when not in use both the staging and shelving can be folded down to make way for pots or growing from the ground. And here’s how it looks folded down. Staging is without doubt the most popular greenhouse accessory and in most instances essential. A normal set up is to have one side of staging and shelving running the full length of the greenhouse. This leaves the other side of the structure open for growing from the ground, pots or growbags. 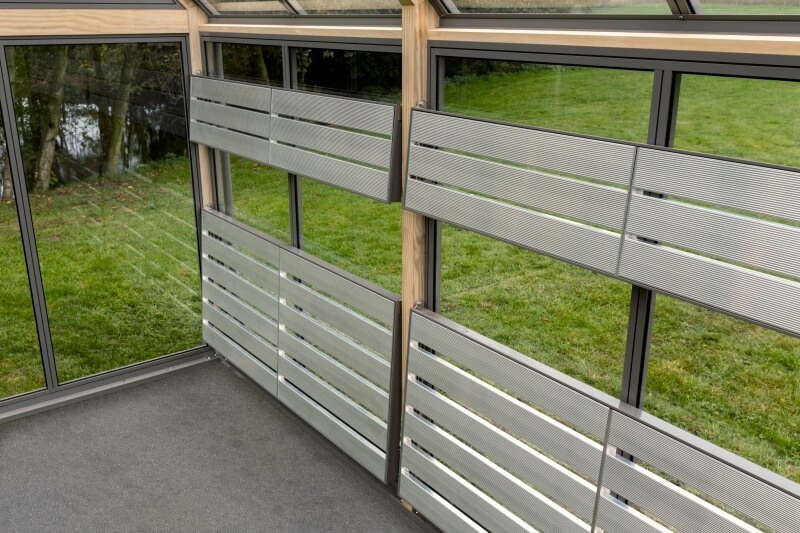 Forget wooden planks nailed together, the staging and shelving system on a Cultivar greenhouse is an innovatory and attractive design fit for the 21st Century.